Our stickers are high UV, scratch and weather resistant, backed with hi-tack super glue to handle textures like plastic, metal or cloth. They can be attached almost anywhere and used in a wide variety of situations. Aluminum plates are reflective for nighttime visibility, durable and weather resistant. You can place your patches wherever you prefer: on the back of your helmet, saddle, fenders, rack or on your shirt/jersey. Hearing cyclists call out verbal warnings that they assume other cyclists can hear. Deaf cyclists don't hear or respond to those warnings—putting themselves and Hearing cyclists at risk. 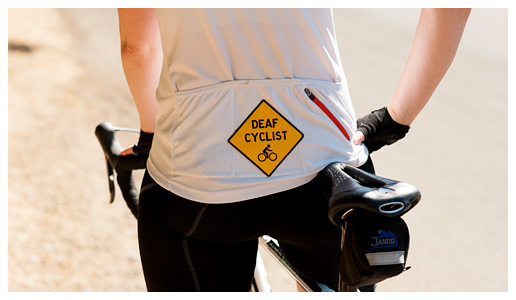 After my own experience of crashing into another cyclist, I was inspired to create DeafBikeSigns as an effective way for Deaf cyclists to inform other cyclists of our deafness and alert others that we don't know they are there. We know that all bikes and cyclists are different. How you decide to display your DeafBikeSigns will depend on your taste or sense of fashion. Some riders will prefer something temporary for specific riding events while other riders might want something more permanent for daily use. How you display your signs will depend on your bike and attached accessories. Be creative! 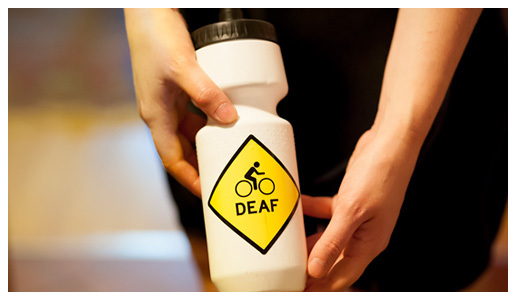 DeafBikeSigns come with three different types of products. Whether you are interested in patches, plates and/or stickers, we have what you need to attach to yourself or to your bike. See "How-to Attach" for more details on how to use the products. If you are a business/bike shop wanting to buy products in bulk to sell at your shop, we would love to do business with you. Come on Facebook, like us and socialize with other deaf bike lovers from all over the country. We also have connections with cyclists from the UK and Canada who have purchased our products. Our fan page will keep you updated with DeafBikeSigns. Share your experiences (or learn about the experiences of others) and throw in some photos. 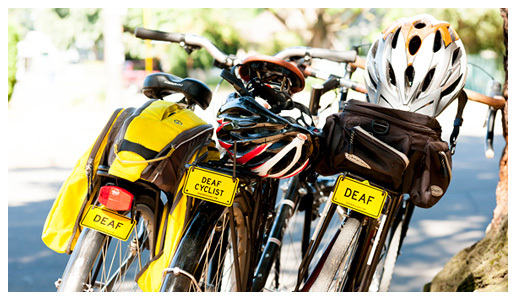 Become part of our own deaf-related bike community! Any Questions? Any concerns? Difficulties on Web? Checkout Issues? You can contact me, Carrie Brewer, by emailing me at carrie@deafbikesigns.com. You can also email requesting a videophone call; provide me with your name, number and the best time to call. Also, please do write if you have stories to share of your biking experiences or if you have new ideas for our product line. Share away!